What are others saying about Trickster? 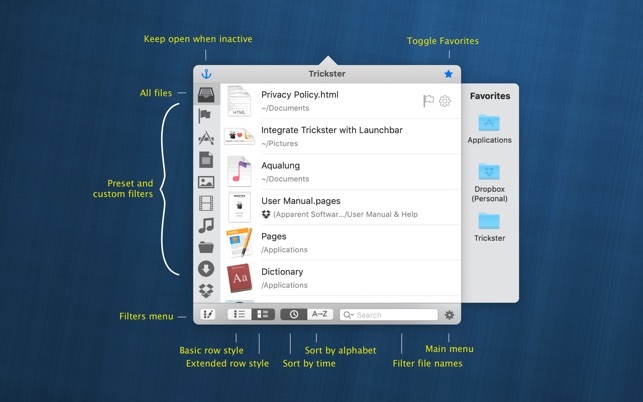 If you work with files, Trickster is the ultimate productivity booster for you. 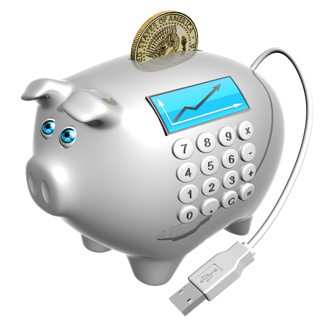 Quickly access to your recently used documents, folders, and applications. All your important stuff is now just a couple of clicks away, accessible from your menu bar. Did you just open a document in Pages? It’s in Trickster. Did you just download a file? Don’t bother searching your downloads folder. Trickster has it one click away. Did Dropbox sync files from another computer? It's in Trickster. Everything you were supposed to be working on is a click away, ready when you are. 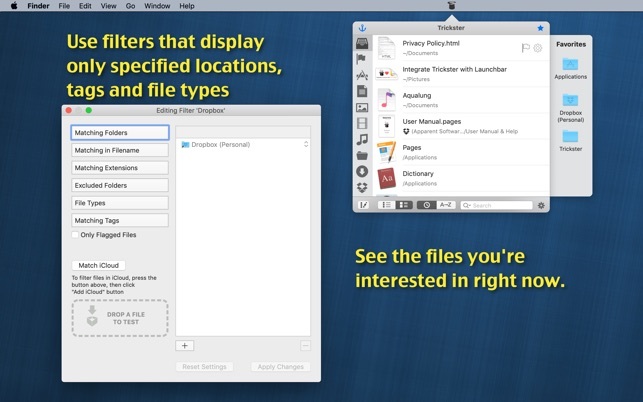 - Drag and drop files from Trickster to Finder or any other application like you'd do from Finder. 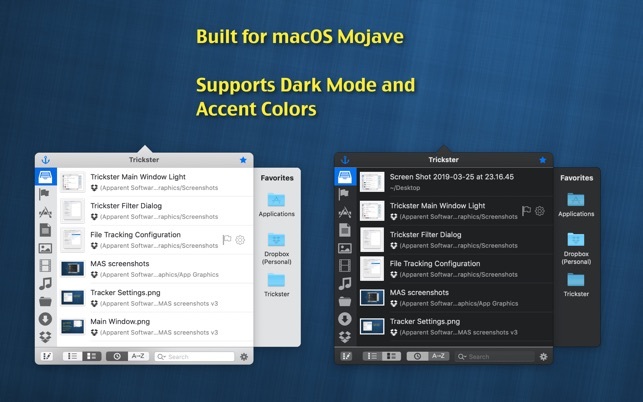 - Open files and applications from Trickster, preview them or reveal in Finder. - Includes ​Preset filters to only display images, audio files, videos, documents, applications, folders and specific locations. - Create your custom filters based on location, file types, Finder tags or string matching. - Track only relevant files and ignore all the rest. 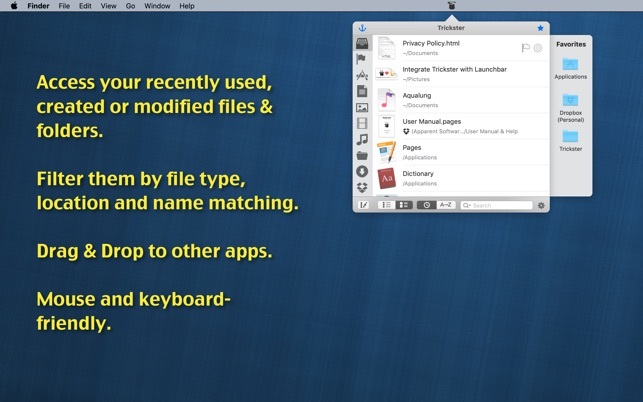 - Favorites "sticky" bar gives you fast access to your most frequently used files, folders, and applications. Drop files on a 'favorite' folder to move it there or drop on a 'favorite' application to open it with that particular app. Trickster is 100% keyboard-friendly. For ultimate productivity and speed, you can use it entirely without a ​mouse or combine mouse with keyboard shortcuts and hotkeys. I tend to save things in places that I don’t quite remembe where it was. And even when I do know where it is, it take many clicks to get to that folder. 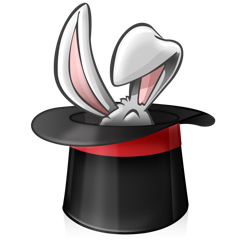 Trickster has made my life much easier as I know to go here right away. Being able to omit certain folders makes it better than the “all my files” view in the OS finder. Highly recommend. Fanstastic tool. It’s essential to my daily workflow for video editing. Keeps new files right at my fingertips (such as downloading a new logo, then dragging from Trickster straight into Premiere, rather than having to dig through the folders in an import menu or Finder window before importing). Speeds things up. 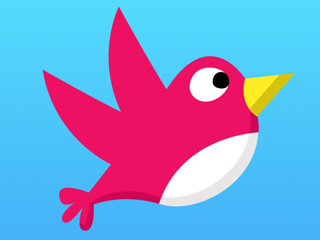 © 2012 Apparent Software Inc.